Physical education classes and extracurricular sports teach children the value of diligence, fitness, and teamwork. In order to provide the optimal exercise experience, you need to make sure that your space is furnished with proper gym equipment. Hertz Furniture&apos;s school gym equipment will promote physical fitness for all children. Where can you find great school gym storage? 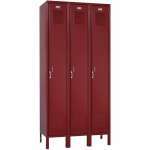 We have a full line of school lockers and steel racks so you can provide great storage for uniforms and athletic equipment. With the right tumbling mats, lockers and logo chairs, you can demonstrate your regard for hard work and persistence. How can I help players get ready for the game? Whether students are playing on the court, suiting up or watching from the sidelines, we have the equipment you need to support their endeavors. Even before your players get out there on the court or field, they need proper furniture to ensure that they are prepared for the big game. With large school lockers in the locker room, athletes will have enough space to keep their uniforms and equipment in close proximity to the gym. 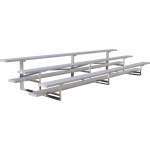 If your school has sports teams such as football and wrestling that use a lot of special equipment and bulky padding, you will need athletic lockers to provide a large open area in which everything will fit. Do students really need personal storage in the locker room? Nothing is more frustrating to a hardworking student athlete than getting to school and realizing that important equipment or jerseys have been left at home on the day of a game, practice or gym class. With steel baskets and racks, you can provide each student with a personal space for uniforms and sneakers, even if you don't have very much space to spare in a locker room or gym. An open design provides ventilation which diffuses smells from wet or dirty clothing. As players are getting their heads in the game or watching their teammates play, they need a supportive place to sit. 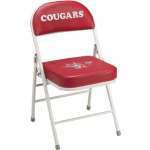 Logo chairs provide comfortable cushioning that promotes school pride. These padded folding chairs feature the team mascot and team name. They can be ordered in a choice of padding and accent hues to coordinate with school colors. Logo chairs offer more than just a place to sit. The extra color and team paraphernalia liven up the gym and encourage athletes to play their hearts out. When students come into the gym and see that there is coordinated and cozy furniture, they will understand that your administration supports their athletic activities. This attractive seating option can also be sold to alumni in order to raise money for your athletic department. Physical fitness isn't all about interscholastic competitions. Even students who aren't part of a particular extracurricular team can enjoy the benefits of great gymnasium equipment. When it is time for gym class or recess, enticing gym furniture will encourage all children to be active and challenge themselves to try new things. How can I make the school gym more exciting? 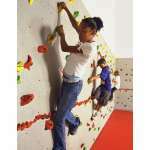 Everlast climbing walls will make a fun and exciting addition to our gym equipment. They can be mounted directly onto the wall so they are easy to access but don't take up very much room at all. As students motivate themselves to ascend using the Groperz hand holds, they will develop important physical, social and emotional skills. Climbing promotes strength and persistence in a fun and challenging way. While having a rock climbing wall right inside your gym is convenient, it is important to make sure that children are properly protected. When the wall is in use, safety mats should be placed directly under it to cushion children in the unlikely event of an accidental slip or fall. The Everlast cordless mat locking system protects children whether or not the wall is in use. While students are enjoying supervised climbing, the mats ensure that they are cushioned. When students are not supposed to be using the wall, the mats securely cover the surface to prevent unsupervised climbing. When do you need play mats in the school gym? There are other applications in which appropriate padding is needed as well. When children are practicing rolling around or flipping, you need soft play and tumbling mats to ensure that they are protected. 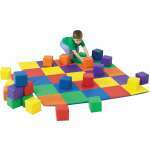 We have cushy and attractive play mats from Children's Factory which are available in either rainbow or solid colors. 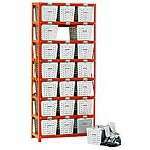 They can be attached via velcro strips to cover a large area and fold up easily for compact storage. You can promote physical activity and curiosity in the classroom as well with enticing play lofts from Strictly for Kids. These exciting indoor play areas encourage children to climb, slide and use their imaginations. Their ramps and steps include railings for safety and their shatterproof windows enable children to view the classroom from above in a safe position. 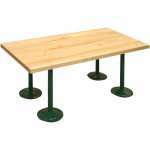 Excellent school furniture is essential in every room of your building. When children have the right gym equipment, they learn to value physical activity and the healthy lifestyle that it promotes. With great school gym equipment from Hertz Furniture, you can ensure that all students get the tools they need to lead a fit and active life, whether they are the star of the team or a regular participant in gym class. Installing school lockers and climbing walls can be complicated. If you need help figuring out how to arrange your gym or locker room, contact the Hertz Design Center for free project-planning advice.